This year’s choir meetings ended with a pleasant social gathering at Blakey’s in King George’s Hall, Blackburn, where we thoroughly enjoyed an evening meal followed by some first class entertainment. Our pianist, Joy Fielding, provided a flawless accompaniment for Lorna Rushton, a soprano from Bolton, who trained at RNCM in Manchester and the National Opera Studio in London. Lorna expertly performed a mixed programme of amusing cabaret songs, I Want to Sing in Opera, Physical Culture, Someone is Sending me Flowers, Usherettes Blues and operatic favourites including Verdi’s Brindisi, Bellini’s Casta Diva, Puccini’s O Mio Babbino Caro and Rossini’s Una Voce Poco Fa. Her programme certainly provided inspiration for our Opera Gala to be performed in the coming autumn. The evening concluded when our conductor, Tom Newall, took the ‘hot seat’ for an ‘Evening with Tom Newall’ . 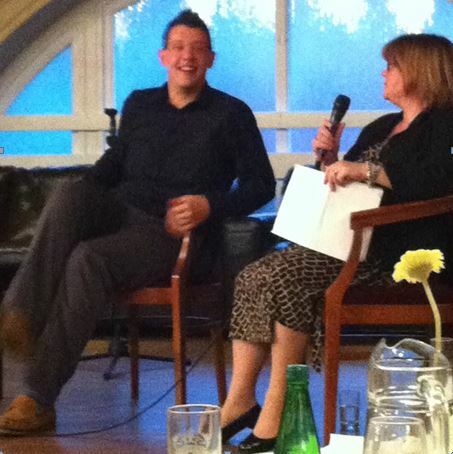 Choir member, Louise Denney, hosted the occasion and asked some very pertinent questions, with Tom providing some very revealing responses. He explained how training to be a conductor replaced his younger ambitions of becoming a pilot and described how his favourite music ranged from Stravinsky to S Club 7! I think we could all conjure up an image of Tom relaxing on some distant desert island beach listening to Mahler’s Symphony No. 2, or conducting Carmen at the Royal Opera House. 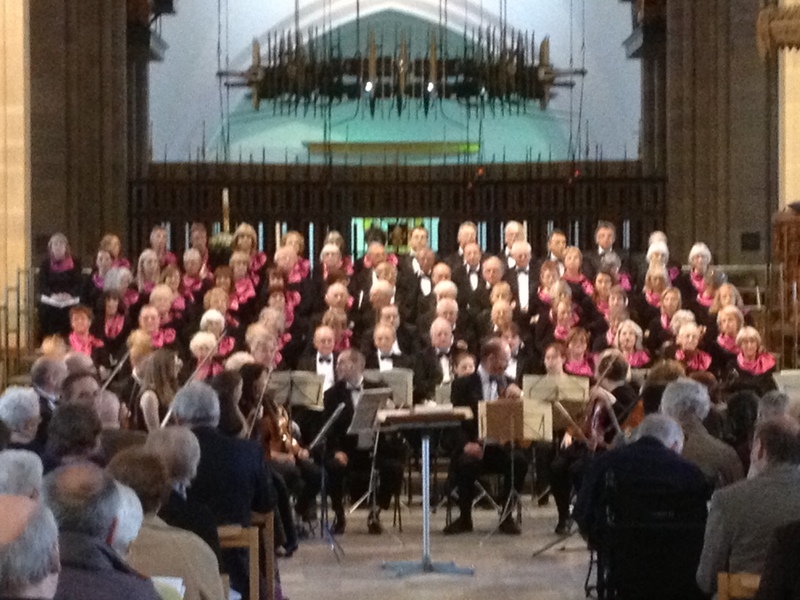 Under the expert guidance of our new conductor, Tom Newall, the hard work came together for our performances of Haydn’s St Nicholas Mass and Mozart’s Requiem at Blackburn Cathedral on Saturday 4th May 2013. 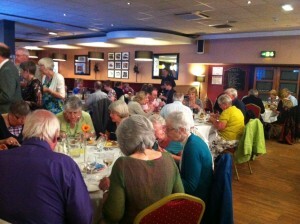 Despite it being a Bank Holiday weekend there was a large and appreciative audience. The concert was dedicated to the memory of Mary Haydock (1925 – 2013), who accompanied the BMS for over 40 years, and it was a great delight that members of her family were able to attend. BMS rehearsals since Christmas have been intense and fun. Tom’s facial repertoire has been as extensive as his musical one as he has encouraged the whole choir to bring the lightness of touch required for Haydn and the drama needed for Mozart. Led by Anne Heaton, the Lancashire Chamber Orchestra joined us once again to underpin the event with their fine ensemble of musicians. As soloists, orchestra and choir met altogether for the first time on the afternoon of the concert for a final rehearsal the excitement was palpable. Tom urged the choir ‘not to peak too early’ but it was difficult to hold back ! Franz Joseph Haydn is better known for his instrumental music but he composed a number of masses whilst in the lengthy patronage of the Esterhazy family in Vienna. His St Nicholas Mass in G major comprised the first half of the concert. In a short but joyous piece the skill of the young soloists was shown to great effect. Jennie Marsden’s effortless soprano range brought a sparkle to the opening Kyrie. Combined with the richness of Emma Stannard (Mezzo) we knew immediately that we and the audience were all in for a treat. So it was, as both male soloists, the mellifluous Tom Morss (Tenor) and double cream tones of Louis Hurst (Bass Baritone) complemented the ladies to provide an exhilarating quartet in the Credo. The Mozart Requiem needs no introduction to most people. The mood is altogether more operatic and intense. During the second half of the concert, the choir was able to display the power of its combined voices in – what for me anyway – was a thrilling opening section. After the might of the Dies Irae and Rex Tremendae, the soloists’ lyrical rendition of the Recordare was an exquisite contrast. The choir remembered Tom’s exhortations and responded with light and shade in the Offertorium. With the final movement, Lux Eternae, the concert finished to the sound of a triumphant final chord reverberating around the cathedral. Around 50 members of the choir sang “He Watching Over Israel” from Mendelssohn’s Elijah and led the singing of hymns at the Royal Society of St George Service in Blackburn Cathedral. 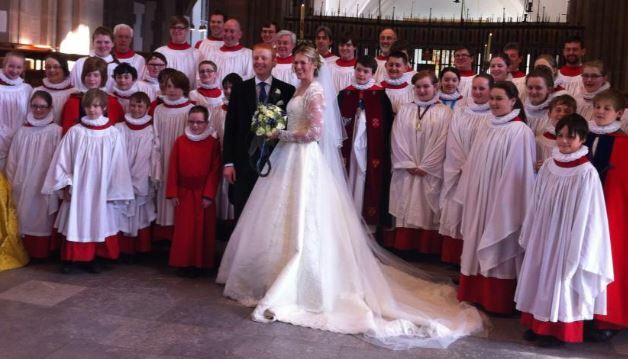 Congratulations and best wishes to James Davy and Sarah Turner who were married in Blackburn Cathedral on Saturday 6th April. It was a brave decision to hold a day-long, Saturday workshop devoted to the Mozart Requiem; a decision, in the event, triumphantly vindicated, not least by the addition to our permanent strength of several people who came as guests. Close to 80 of us turned up on a raw morning at the frankly unprepossessing Salesbury Memorial Hall, there to be faced with an already full car park. False portents all; by common consent, the day was a delightful and thrilling experience that those present will surely always remember. That we could successfully run another such workshop seems beyond question. 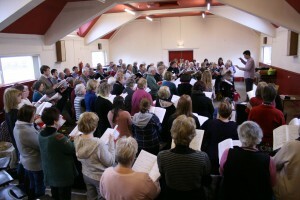 A remarkable 50% of participants were guests rather than choir members – a tribute to the publicity and the efforts of individual members to drum up support. In particular, our Conductor Tom and Chairman Joy can take huge credit in this as in other respects. Guests outnumbered members heavily in the basses (11 out of 16) and slightly in the sopranos (no fewer than 18 out of 34). Only nine male choir members attended – somewhat disappointing – so the 14 male guests were a godsend. Even so, we had only seven tenors in all (what rare creatures we are! ), which can’t have helped the overall balance. Very flattering to our vanity is the number of people commenting in the feedback on the high standard of music-making/singing. Also on the friendliness of the choir and sense of camaraderie at the event. The skill, ebullience and infectious enthusiasm of our conductor– he was truly supercharged throughout the day – and Joy’s epic stint on piano were frequently recorded. 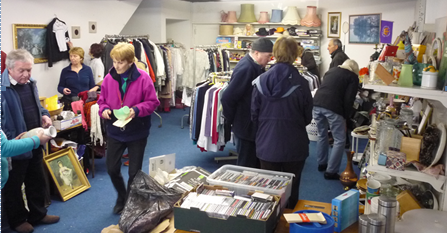 The organisation and smooth running of the proceedings were widely praised. No respondent had an adverse appraisal of either the enjoyment of the day or its learning value. An astonishing 95% recorded the highest degree of satisfaction with both aspects. That one can bandy such facts and statistics – and many more – is thanks to the devising and subsequent analysis of a thorough feedback survey among participants. Few will forget the warm-up routines conducted by Tom’s guest and mentor Caroline Clegg: hilarious, albeit chastening for the slower-witted of us. A special tribute to those brave souls who, with next to no practice or preparation, came from the ranks to do solos. Well done! Among others to be thanked are those who provided such excellent cakes for the breaks; the kitchen helpers, chair arrangers, and label stickers; all those who brought along friends and those who made guests feel welcome. 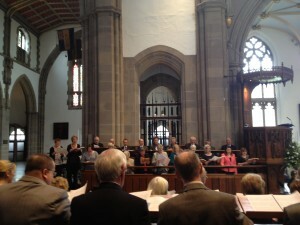 This was our choir operating at its very best, musically, organisationally and socially. The building, unlovely as it is, proved eminently suitable for our needs. Those who understand such things declared the acoustic excellent. It was hard to think as we soared and thundered through our performance at the day’s end that it had ever known such glory. For the second successive year, members of the choir led the singing of carols at the annual ‘Light up a Life’ service for the East Lancashire Hospice at Blackburn Cathedral on Monday 17 December. The choir also sang two carols: firstly ‘Myn Lyking’ with words from the 15th century followed by John Rutter’s modern ‘Star Carol’. ‘Light up a Life’ services have taken place over many years and provide an opportunity for relatives to come together with others to remember their loved ones and the help and care given by the staff and volunteers of the hospice. However, the services are open to anyone who wishes to remember a loved one in this way, whether they have been involved with the hospice or not. The East Lancashire Hospice, while based in Blackburn, serves the health authorities in Blackburn with Darwen, Hyndburn and Ribble Valley. The first service was held in the Cathedral in 2000. After a few years, they were held in four venues – the Cathedral, Clitheroe Methodist Church and Anglican churches in Accrington and Darwen. There was a decision to hold the service in the grounds of the hospice following the example of Pendleside Hospice which holds well-attended services in their grounds. Sadly the service was hit by very bad weather so it was decided to revert to a single service to be held in the Cathedral and it was at this point that Blackburn Music Society became involved and, to quote from the Chair of Trustees, “the choir is a very welcome addition to the proceedings”. Kathleen Cross Member of Blackburn Music Society and a trustee of the East Lancashire Hospice. Saturday morning a cappella carol singing in Blackburn Market was a new venture for the Music Society and was enjoyed by shoppers, stall holders and participants alike. A collection take at the event raised £65 for the NSPCC. 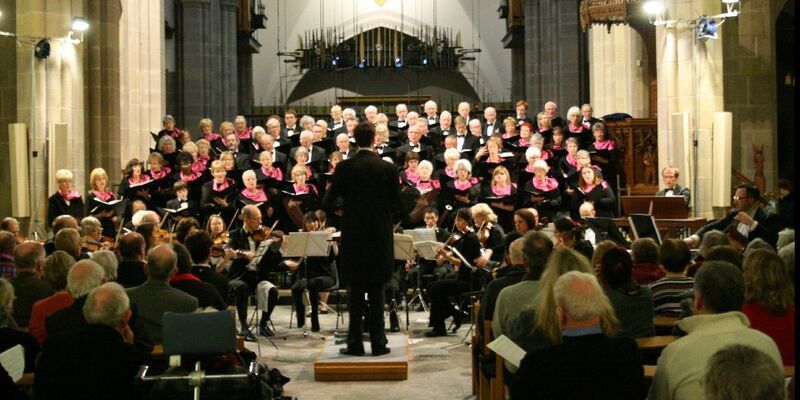 On the wettest night of this wettest year, Blackburn Cathedral was filled to its doors for Blackburn Music Society’s annual “Messiah” performance. 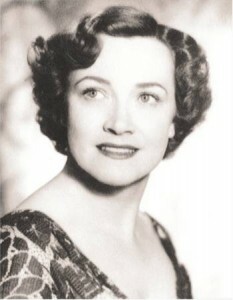 It was probably the last celebratory event of this, the Centenary Anniversary of Kathleen Ferrier’s birth and one of the many that have taken place, mirroring the great contralto’s career itself, in places varying from huge concert halls like London’s Festival Hall to intimate venues like Keats’s House in Hampstead, not far from where she lived in London, to church halls in the home counties and in cities and towns both here and abroad all remembering with affection our Kaff. 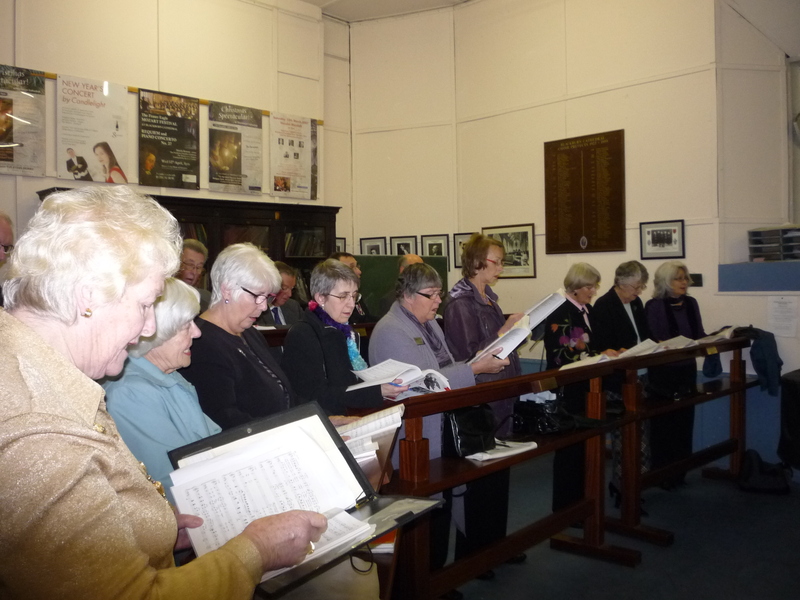 The Blackburn Choir, with whom Ferrier sang on many occasions, were both honoured and delighted to be a part of the celebrations and their loyal public turned out in force. The Cathedral looked fine and it was warm too, but no warmer than all our hearts as we came back to Blackburn, where it all began. Reviewers, wiser and more musical than I, have, over the years, reviewed this great and majestic work and hackneyed phrases come to mind too easily, but for what it’s worth I can only try to make one more attempt. First the four principals: the Ferrier Society knows three of them well, as they have been the winners of our Bursary Competition. The baritone who was to have taken part, another Bursary prize-winner, was indisposed and his place was taken at the very last moment by the baritone Roger Barlow, who, in effect, and for this reason, must be considered the hero of the night. Fflur Wyn, the soprano and the mezzo, Sarah-Jane Lewis, who both looked so young and lovely, stood with perfect poise and dignity to the left and in front of the choir and orchestra in the heart of the Cathedral church and the tenor and baritone too stood at their opposite side. They all fulfilled our every expectation. It was immediately noted that all the soloists had wonderful diction, this twinned with the musicality of their performance made for a delightful sound. The difficult runs in the aria ‘Rejoice Greatly’ in particular and the wonderful and oft missed aria at the very end, “If God be for us”, were lovely to hear. The grave and profound feelings of the mezzo too as she uttered the words, “He was despised” and “He gave His back to the smiters” – “He hid not His face from shame and spitting” and the ever joyous “Oh Thou that tellest”, reminded us again that all we need do is to go back to the words. The tenor, Nicky Spence, held us all rapt; he has a good and commanding voice, as befits the work; he held his score high, stood firmly and addressed the congregation, for it is indeed a religious work, with authority. From the recit, “Comfort Ye”, to “Every Valley” – “Behold and see” – all the tried and true recits and arias, there was a lovely tone throughout. The voice of the baritone, Roger Barlow, the hero of the night, was valiant, as opposed perhaps to Homeric, especially in the arias, “Thou shalt break them” and “The trumpet shall sound”, which was very slightly lacking in power, but the soloist was well in command of the score throughout. The trumpeter’s obbligato, it must be said, was excellent. The choir and orchestra were marvellous, supporting the soloists splendidly, blending their notes expertly and holding the performance together, as indeed they must, like the mortar in a strong wall, the second half perhaps more so. Is it possible that the choir sounded just a tad wayward in one or two places in the first half? The conductor expertly kept them all going at such a cracking pace but once or twice the listener felt, perhaps……? Later, I was told it was the conductor Samuel Hudson’s first “Messiah”, but just as, all those years ago, Kathleen Ferrier said to Isobel Baillie, that paragon of the oratorio platform, that she had just sung in her first big “Messiah”, the redoubtable Miss Baillie replied: “Well my dear, you can be assured it won’t be your last!” In the second half, however, the choir came into its own and held firm; how good it is (and how easy) for an audience member to sit back and relish the sight and sound of a full company of experienced singers fairly straining at the leash, lovely. The great “Hallelujah” was as good as it ever is and the soloists sang full voice with the choir, as they did in the “Amen”, exciting, a splendid sound, the sopranos and the tenors, the altos and the basses linking so cleverly together; yes, aren’t they clever, I thought, to be able to make such a heavenly sound? Comment is almost impertinent, but the “Amen” must be worth a mention; it was so beautifully executed, with joy, a wonderful summing up in sound. The performance received a well-deserved standing ovation from the capacity audience. It was still raining hard as we left the performance, warmer still and thrilled at the end of a wonderful evening of good music, a perfect climax to the Centenary, everyone doing us so proud. The title of this latest concert was really well chosen by our retiring chairman Mr. Brian Healey. 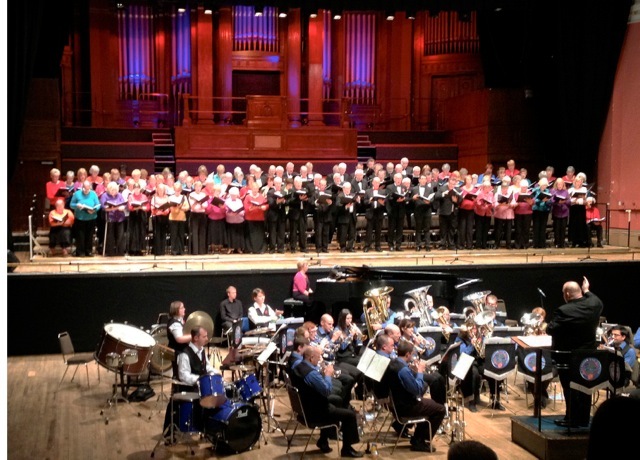 It was an impressive endorsement of the commitment of the three local amateur music groups’ to high standards as Blackburn Music Society, Blackburn and Darwen Band and Bolton Choral Union combined to play thrilling musical tributes to the composers of some of Hollywood’s and Broadway’s best known musical scores. The enthusiastic audience who packed the stalls in King Georges Hall last Saturday evening, were transported and delighted as they listened to the choirs sing in perfect harmony, one good tune after another, and marvelled at the vigour and energy of these local music enthusiasts, conducted and inspired by Michael Greenhalgh and Nick Sheppard. They listened with great pleasure to toe tapping medleys from Rodgers and Hammerstein musicals, selections from Disney, West Side Story and Miss Saigon, along with memorable melodies by Jerome Kern and Andrew Lloyd Webber. Blackburn and Darwen Band gave a rousing performance of “Pirates of the Caribbean” and played superbly all evening. They really are Championship Brass. Richard Pollock was the outstanding tenor soloist. A versatile performer all evening, with a voice that could move you to tears in “Bring Him Home”, that beautiful lament from “Les Misérables”, and delight and amuse in a confident, fast, brash delivery of ” Luck be a Lady Tonight” from “Guys and Dolls”. Warm applause also for the sensitive, stylistic piano playing of Joy Fielding, the talented Stephen Baker on keyboards and Matthew Thomas for his fabulous musical arrangements. Thank you Blackburn Music Society, Bolton Choral Union, and Blackburn and Darwen Band for such a memorable and enjoyable evening. Thunderous applause all round!